Personally, when I visit the front page of a WordPress blog, I don’t mind seeing the full content of each recent post. You an control how many posts are found on the front page of your full version WordPress blog by choosing Options > Reading > Show Number of Posts on the Front Page in the Administration Panel on the full version of WordPress and Blog Pages: Show at most… on WordPress.com blogs. Choose whatever number you like. Depending upon the length of your typical posts, this could be 1, 3, 5, or even 25. Whatever you feel is appropriate. However, when I do a search on a WordPress blog, or visit the categories, archives, or any other multi-post pages, I’m intent on finding what I want, not reading through every post that may or may not apply. I’m on a quest, so I want information fast. This particular WordPress Theme, Rubric by Hadley Wickham, shows full posts on search and category pages – check it out (NOTE: The first post you see may be this post so scroll down the page) and witness my frustration. I’d love to change it, but I have no control over WordPress.com Themes. I believe excerpts, especially in search results, helps the reader get to the information they need faster, making them happier readers, thus I’m in favor of using excerpts on multi-post pages in all WordPress Themes, not full content views. Creating excerpts in multi-post views is the job of the WordPress Theme designer, and one of the choices they have. If you are using the full version of WordPress and have access to your Theme template files, you can change it to excerpts from full post displays yourself. WordPress makes changing your content displays on your own full version WordPress easy. To change the way your content displays on these pages, edit the appropriate template files with the built-in Theme Editor (Presentation > Theme Editor) or any text editor and search for the_content() and change it to the_excerpt(). That’s it. Do NOT change it in your single.php or page.php, if you have them in your Theme, as that will force only the excerpt and not the full content to show up on these single post views of your blog. Not a good thing. By default, WordPress shows only the first 120 words or so of a post as the excerpt. It also strips out all links, styles, and tags so only the text appears. So if your excerpt doesn’t exactly match the look of the top part of your post, this is why. There are two other ways to set your excerpt, which should work with WordPress.com blogs, overriding the_content() template tag. On the Write Post panel in the Quicktag buttons, there is a button called more. Set your cursor to wherever you want the excerpt to be set and click it. It will inset <- - more - -> into your post. On the front page of your blog, the excerpt of the post will show until that point. When the visitor clicks the “read more” or “continue reading” link, they will be taken to that point so they can continue reading without having to read over what they have already read. The other method is to write an explicit excerpt. Under the Upload Image box on the latest versions of WordPress, or between the title and post content of the old versions, you will find the Optional Excerpt box. Click on the + plus mark in the upper right corner to expand the box. Type in whatever you want for the excerpt and it will be shown on the front page. On Taking Your Camera on the Road, I wanted three different types of excerpts shown. It works so well, you don’t even notice unless I tell you what I did. If this sounds like something of interest to you, I explain it fully, with the solution, in my article on Customizing the WordPress Loop for Excerpt Queries. If you are ready to turn over some of your multi-post pages to excerpts, then also take time to read Writing With Post Excerpts and Feed Excerpts in Mind to help you think about how you write when your blog displays excerpts. This entry was written by Lorelle VanFossen and posted on July 19, 2006 at 1:20 am and filed under WordPress, WordPress Themes, WordPress Tips with tags how to use wordpress, wordpress, wordpress help, WordPress Themes, WordPress Tips, wordpress tutorials. Bookmark the permalink. Follow any comments here with the RSS feed for this post. Post a comment or leave a trackback: Trackback URL. Using the more button is a good idea but to me it has a little drawback especially if you use Technorati tags. I am not very sure of this but I noticed that Technorati robots always skipped my posts everytime I used the more button. I am using Optional Excerpt and include the tags at the bottom. Technorati never missed my new post. What I would like to see is the use of Show/Hide button instead of the usual – WP reads the whole page again and display it(like a refresh or reload). This way it would be faster for our readers and probably save some bandwidth. Hiya. Thanks for the great article; it really helped! Thanks for that article. You helped me solve a big problem with the excerpt that I’d been having for days. Thanks for these tips. The new theme that I added to my blog, would show all of the post in the category and I don’t like this either. I am like you, when I want to find something, I want to find it fast. Thanks for writing this post. I think that I will write a post about this and give you a backlink by referring people to this post. Your site has become my favorite site! Thanks. Now I know what the does, and it’s exactly what I was searching for. Thank you, your post help me. Thank you for writing straightforward instructions in English. I’ve been to the Codex a few times and still didn’t get it. Your instructions I got right away. Thank you! Is it possible to not use excerpts on the blog but have search engines cache and display your search results as excerpts? Is that possible? Not to my knowledge. The more content a search engine indexes, the more keywords it can find and the better it will rank your site in the search results. I think it is more important to offer readers excerpts, especially for on-site search, category, and multiple post pageviews so they don’t have to scroll down and down and down to find what they want and need. Do you know if it is possible to show part of the post only in the feed? like links to download content, which will only be available to RSS subscribers? To show only part of the post in the feed, use the MORE link to insert a “Continue Reading” link. This will automatically cut off the content in the outgoing feed to whatever length you want it to be. I have a problem. Initially, I had posted some articles in my site but found out that the articles were too long. At that time I did not know of the WP default “more” button which I can use to create excerpts to my post. So I downloaded the advanced-excerpt plugin and activated it after uploading to my wp-content/plugin folder. Thereafter, unsatisfied with this, I deleted my advanced-excerpt plugin and tried visiting the website again but again the entire post contents do not show at all. I tried changing theme but nothing changes. So I copied out every post that i had in my website onto wordpad and saved it & got hold a plugin to delete all my posts in my website. Thereafter, I tried to re-post again one of the previous post entries by copy-paste from the said wordpad just to verify whether it works now that the advanced-excerpt plugin is no longer activated. To my surprise, it still doesn’t show the entire post contents. Please visit my website. I don’t know why. Any assistance as to how to problem shoot? Kindly bear in mind, I am not familiar with theme editing nor html or css. Perhaps a step-by-step guide would be useful for me. I answered your question in the first place you asked. Once you start messing around, things go from bad to worse. Remove the current WordPress Theme and deactivate all of the Plugins. Upload the backup version of the Theme before all the messing around with things, and turn on the Plugins one by one and test. DO NOT USE WORDPAD nor Word for anything that goes near your blog. Notepad or the free NoteTab text editor are best. And please direct these WordPress support questions to the WordPress Support Forum where you can get prompt help and personal service to solve your WordPress problems, especially when they are of a critical nature bringing your site down. Thanks for the info a great help. 2.) what is a Theme editor and where could I get it? What is a Theme editor and how could I go there? Why can’t I use the “optional excerpt”? I tried and It worked! thank you so much! The Theme editor is found in the Design Panel of WordPress. It allows you the ease of editing your WordPress Theme template files from the Administration Panels of WordPress. You can use the optional excerpt or anything you want. This tutorial tells you how to display post excerpts ONLY in WordPress – no optional but by force. Thanks for this, this site is a big help. Is it possible to have only an excerpt in the RSS feed and not the whole post? I’m finding there are quite a few blogs basically stealing the content from my site and posting it on theirs verbatim from the feed and would like to stop this – is this possible? You can change your WordPress Theme to only show excerpts only on the front page, which influences the feed, or use the MORE button in your blog posts to set the point manually where you want to make the cut off point. You can also go into the Administration Panels in your Settings or Options and set the feed to display full or “summary” posts. Everyone is getting their content ripped off. This doesn’t stop the scrapers, it just prevents them from getting all your content. See What Do You Do When Someone Steals Your Content for more specific information on how to handle content theft. Thanks kindly for the help – it’s a cartoon blog so the scrapers basically get the text post but not the cartoon at least – still it’s irritating seeing your work on other people’s sites – I imagine the duplicate content doesn’t help you improve your search engine rankings either 😦 Thanks also for the link – have reported the sites as spam sites to google – let’s see what happens! Thank you for this post! This was very helpful. Hi, I’m new to WordPress.I could not find the build-in Theme Editor and the Presentation. Could you help me out. The Theme Editor is under Appearance > Themes in WordPress 2.7, and under Presentation > Theme Editor in older versions of WordPress. What I am trying to accomplish is to show “the excerpt” for only the most recent post in a category and then just titles for the remaining posts in the category. So basically my code pulls the 4 most recent posts from category 170 and displays excerpts for those 4 most recent posts. But what I would like to do is just display an excerpt for the most recent post in category 170 and then just the title of the next 3 posts. My code is below, any input is welcome. See WordPress Conditional Tags and tags associated with the_content() and the_excerpt() template tags on the WordPress Codex, the online manual for WordPress Users, for tips and techniques. Am I able to display excerpts using the hosted version of WordPress? I have custom CSS but I don’t think it lets me change the php page. By “hosted” I assume you mean WordPress.com? You cannot edit the WordPress Template Files that make up a WordPress Theme on WordPress.com, but you can force each post to be an excerpt by using the More button on the quicktag bar on the Edit Post page. Put it wherever you want the post to end when viewed on the front page of the blog. Lorelle, Thanks for the tut, but for the life of me, I cannot find ANY mention of the_content any any of the .php files, except the one that handles single posts. I tried changing that for kicks and grins, and it did make all posts only able to show the excerpt. I am clawing my hair out. I am using the “gear” theme. Any ideas? The index.php file is the place to change the template tag for the_content. 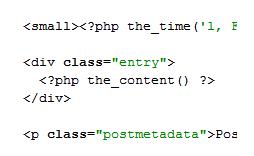 If you changed it in the single.php template, you would shorten your posts. Check the index.php template within your WordPress Theme folder, not outside of it. You will find it there. Thanks for your help, but there is definitely no mention of “the_content” in that theme’s index.php. That is wheat sent me elsewhere. There is an instance of the_post, but changing that lead to an undesired result. I am very confused, since this doesn’t make sense to me either. Could it be something specific to just this theme? It could be. Contact the Theme author for details. There are some whacko Themes out there that do all kinds of things that break the rules, so I don’t know and I don’t track what all the thousands of Themes are doing. Good luck with it. Great article, helped me sort out search result excerpts quickly and easily. I completely agree with you about search results showing full posts, I have seen this on numerous wordpress websites and it is very annoying! Great post and thanks for you help. Thank you so much for this guide. The gods of Google brought me to this page for a solution that had long plagued me since I posted a 2,000 post concerning tftp setup in Linux. Thank you very much! You have restored sanity to my site’s index page. I have posted a link to this article in case my friends have the same dilemma. Good post. The first thing I lost, while experimenting with excerpts, is the image. My blog is not using a Magazine style theme and I had to upload the images inside the post. With excerpt I will loose the images. I assume I need to tweak the theme to display thumbnail image. Alas the thumbnail image plugin fails when I enable the excerpts. Any quick solution to allow the thumbnails to be displayed with excerpts? Your Magazine Theme author should have information on how to bypass the excerpt filter with their Theme. Check there first. Thanks, as exactly what I was looking for too. You’ve helped sort a problem I’ve posted on WordPress org and comicpress org. I waited a day and then let impatience take over. You’ve now provided the clues that gave me my answer. Plus the bonus of excepts. Comicpress only shows author, title, date and the comic in the category results. I wanted the blog to show too but didn’t know where to start. In comicpress I eventually found the bit for categories inside archive.php. There were lots of archive this and that files including archives.php. I then experimented inserting the word Helloooooooooo in the code at likely points (various divs and if then’s) did a save each time and then refreshed the page on the browser to see the result. The server is running locally on my Macbook thanks to Mamp. Did that a few times until Hellooooooo appeared in the correct place on the page and then replaced it with the php code. Hurrah it worked. Well it did once I formatted the php tags properly. Dreamweaver (which I was coding in) even pops up lists of WordPress tags to choose from each one along-side a teeny WordPress icon. I don’t know if that feature is built in or whether I installed a WordPress helper at some point and forgot. But I’m pleased I found it. A rogue Helloooooooo is still in my page in the post-comic-foot div. I’ll off and remove it then go and answer my own question in the forums. With a nod in your direction. I have WP MU version of the blog and would like to display 10 posts per page, but it is just displaying 10 post only 1 page. So please help me on this issue. You’ll have to ask someone on the WordPressMU forum for specific help. Thanks. Please contact the WordPress Support Forum for help on this issue. Thanks. Found you via a Google search and this post was exactly what I needed! I actually had a theme that was coded to show excerpts and I wanted to change it back to show full posts. Hey I just wanted to thank you so much for writing this great post. I thought it was very well written and I was able to accomplish what I wanted to. Thanks again! Your code didn’t come through but you can use the code from within the post or stick to the option of using the MORE to break your posts into excerpts. Thank you so much for this post! Not a wordpress guy and was able to knock this out in 15 minutes across all the pages including formatting after reading this! Keep up the great posts! Thank you again! Thanks for the great tip. The theme I am using did not provide for shortened posts on the main page, and with this simple code tweak I was able to really clean up my front page of the site. It’s just perfect to find the solution you are looking for. This tip saved me a tonne of time trying to change my full posts to excerpts, thanks. Thx a lot! Works like a charm! i created a wordpress design but in post section when i change Front page displays select Posts page in reading setting then post not show. Please direct such questions to the WordPress Support Forums. I’m not sure I understand. When you click on a link from the front page to the single post pageview, the post is not show? There is a problem with your WordPress Theme. Please switch Themes to see if this resolves your issue. I’m so glad I found this post! I couldn’t get this figured out for the life of me until I found your instructions. Thank you so much. I have three blogs to write for: my personal, my book, and the organization I run. I would like to be able to cross post specific posts. For example, I would like post on a theme related to my book on my book website, marked under a specific category. I then want all the posts I put into that category on that website to appear in another blog on another website as blog posts without having to retype them. How can I do this? You can get penalized by Google and other search engines for duplicate content, so I recommend that you use feeds to import post titles and maybe excerpts into the sidebar and not cross publish content to avoid SEO penalties. You can use the feed widget in the sidebar built into WordPress. Thanks for the great information about turning full length posts into excerpts. My articles are long and my front page will benefit from doing so. I prefer to use the more tag if possible. I have wordpress on my own domain and have tried manually entering the more tag into my posts but nothing changes on my site. I’ve tried entering it via Visual view and HTML view, but again, nothing changes Can you advise. If the “more” does not work on your site, please change the WordPress Theme and test it that way. If it works on another Theme, the Theme is out of date and should be updated or replaced. If it doesn’t work on one or more Themes you test with it, then something is wrong with your installation. It should work automatically. Hi, I’m looking for a widget for the sidebar that display each of my post in short excerpt, I want the excerpt to look something like google adsense ads, so that the ads blend in with the excerpt. Do you have any idea how to do it or where to get such widget? I was googling for this, and came to your site, so I thought maybe you can give me some idea, Thanks. I believe it is a violation of Adsense terms of service to emulate their ads or “blend” them in as they need to look like ads and not something that would fake out a visitor. If you wish to go forward, just style the CSS accordingly. Years ago, this type of effort got people banned. Don’t risk it. Many thanks, it’s work for me. i am looking for a solution to this problem. Please check the author of that Plugin for help. Hello, thanks for the informative articles. A question if you don’t mind..the theme I am using has excerpts automatically show for the “recent blog posts” on my site’s home page. I would like to remove the excerpts all together, and simply have just the blog post title and the photo. Do you know of a way to do this? I understand that having excerpts would probably be best, but I just don’t like the way they look; I think having just the post title and image looks cleaner. I should mention that the theme options do include an option to choose how many words should show for an excerpt. Entering “0” doesn’t do anything. Thanks for any assistance here. I’ve spent over an hour searching google and the forums. There is no answer to this question that I can find. The answers are in the article. First, contact the Theme author for help and a possible alternative version or method they recommend. Other than that, the tips in the article show you how to manually change this in the WordPress Theme. There are also links at the bottom of the article which answer all your questions. Do remember that this isn’t about how you want your sign to look. It’s about what best serves your readers. Thanks for the reply Lorelle. Sorry, maybe I’m missing something in the article, but I see no mention of how to prevent excerpts from showing altogether? There is a mention however, of how creating excerpts in multi-post views is the job of the WordPress Theme designer. After reading through some more of your articles on excerpts, you have me more convinced that they are probably a good thing. I just personally think that a page title says enough. When I’m perusing a list of blog articles, I think it’s easier and faster to simply look at the post titles and determine if they are worthy reads based on the titles alone. Having to skim all the excerpts seems a bit redundant when trying to find something fast. On the other hand, I can see how excerpt can be a necessity for rss feeds, etc. I definitely would like to maintain excerpts on my site for rss, etc, but for aesthetic purposes, I would rather simply have just a photo and title. My site is a graphic design site featuring my work and blog articles, so I want everything clean and simple. If aesthetics didn’t matter so much to me with this site, then I could see myself using excerpts. 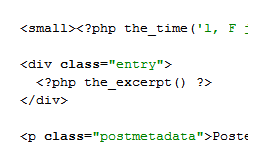 What I did to prevent excerpts from appearing on my home and blog pages, was to remove the following code from between the div tags: on my “recent_post.php” file and “template_blog.php” file. I’m hoping this doesn’t screw anything up, but it appears to be doing the trick. My question now is, do you or anyone know how I can still choose my excerpt text so that search engines and rss feeds still read it, without showing them on my website? Thanks for any follow up. I find your articles quite informative, and often times find myself at your site after searching for a question in google. Obviously you are doing something right. I would ask these questions in my theme authors support forum but they consistently refuse to answer even the simplest of questions (not just from me, but from others as well). Thanks. To change from excerpts to full posts, as mentioned in the article, edit the WordPress Theme’s appropriate template files (listed in the post) and change the_excerpt() to the_content(). However, I still recommend you have this done by the designer or follow their instructions as they are the ones most familiar with their WordPress Theme. That technique works on ALL WordPress Themes if they follow convention and standards. Excerpts are a good thing if you tend to write long missives. I don’t know what recent_post.php or template_blog.php are as I don’t follow odd Theme conventions, and those sound odd. Head to the Theme author for details. If you wish to make all your posts “go away” from the front page and be accessible through tags, categories or a separate “blog” link (old fashioned and annoying to most readers), in Settings, choose a Post or Page to be set as your “front page” and let that be the front page. If you wish to write a custom excerpt for every post, use the Excerpt option on the Post panel. If you do not see it, click Screen Options and enable it. WordPress, by default, will use the Excerpt if filled in. Search engines will find anything that is on your site and indexed through the sitemap.xml file. If author of the Theme you are using refuses to give free or paid support, get a new Theme. There are thousands to choose from. Don’t tolerate bad behavior nor lack of support. I don’t think you understand what I was asking. I was NOT trying to display full posts, I was trying to display an image and title ONLY (that’s it, no text from the actual post, and no excerpts). This really isn’t an uncommon way to display blog posts on a home page. I see it in many popular themes. My site is almost finished, so changing themes is out of the question, but yes I agree, support could be a bit better. That is why I was asking my question here. Anyway, thanks for the replies. I will see if the theme author can clarify this for me. Ah, you weren’t specific as to what the end goal was. Changing WordPress Themes can happen any time and customization can easily move from Theme to Theme, so don’t let that hold you back. If you are using a premium Theme, you will have to talk to the author. I do not help with paid Themes, which is why I removed the link you included. For information on featuring posts only, see The Loop in Action on the WordPress Codex under Different Archive Formats. If you did it right, it would work. Double check you did this on the right WordPress template files and all that apply. Ahh, man this post saved me so much headache. I was unfortunate to buy a blog template without the achieves the way I wanted it. Google have me the big slap for duplicate content for my categories matching my post. Uhhhh very frustrating, but I just wanted to stop by and say thanks so much for the great blog post. It helped me out so so much! Actually, there are several Plugins that will convert full content to excerpts now. That’s one of them. I love it that WordPress has evolved to make it so easy to make such changes with WordPress Plugins. Still, I wish this one was in the core as it is so commonly requested and a basic functionality of WordPress. The “more” helps, but you have to remember it every time. Thank you so much, clearest explanation I found about changing the way posts are shown. I started yesterday with wordpress and everything went much in automatic mode until i found I needed to show complete posts, and my template seemed to have excerpt by default. as your anchor text. Be sure to let me know if this is okay with you by emailing me at: latoyaballinger@t-online. Sorry if this is basic question… I am pretty basic! My blog is a free version and I am using Elegant Grunge theme. Does this theme have the facility to display excerpts of my posts? I can’t seem to tell. Can I change to display excerpts using the above directions using code – swapping ‘content fot ‘excerpt’ and adding in the ‘more ‘ tag? I can’t seem to find ‘content’ in my text editor view? WordPress.com sites do not allow you to customize the WordPress Theme elements such as forcing the display of excerpts. Few WordPress Themes force excerpts on the front page, which is the page you are most worried about I assume. To control the length of the excerpts, simply use the MORE button feature on the toolbar in the post. Set your cursor to where you would like the excerpt to end and click the MORE button. Done. Easy. The article’s information is from 2006 and relates to only the self-hosted version of WordPress. Thanks! On our WordPress site we can’t seem to get it to display a preview only. I looked through all the PHP files under theme editor and it just doesn’t have the code you mention. I realize this is now 8 years old. Is there a simple way to adjust this setting still? the site you were talking about is using the Twenty-Eleven WordPress Theme at the time I looked at it. I assume by “preview” you mean excerpt. Simply use the MORE button from the Post Panel. Place your cursor where you wish the expert to end and the “continue reading” link to appear on the front page displaying the post, and click the MORE button. That will put an excerpt at that point. To change it in the WordPress Theme, you will need to create a Child Theme for that Theme and change the home.php, front.php, or index.php template file (depends upon the Theme) per the article instructions. This protects the parent Theme during upgrades while allowing you to modify it to meet your needs. Honestly, I’d use the More button. What i don’t realize is in truth how you are now not actually a lot more neatly-liked than you might be right now. You are so intelligent. You already know therefore significantly in the case of this matter, made me personally consider it from numerous numerous angles. Its like men and women don’t seem to be interested until it is one thing to do with Woman gaga! Your own stuffs nice. At all times take care of it up!